Washington State University’s AgWeatherNet (AWN) is a large automated network composed almost entirely of Campbell Scientific products. AWN’s purpose is to provide current and historical weather observations from across the state. These observations, along with advisories, weather-data products, decision-support systems, and models, are designed to help improve agricultural production and product quality, optimize resource use, and reduce environmental impact. There are currently more than 160 stations in the AWN, primarily located in the irrigated regions of eastern Washington State. They continue to expand this network, with the ultimate goal of having at least one station in every county. The first station was installed in 1988, and the network expanded in western Washington and into the arid regions of the state. 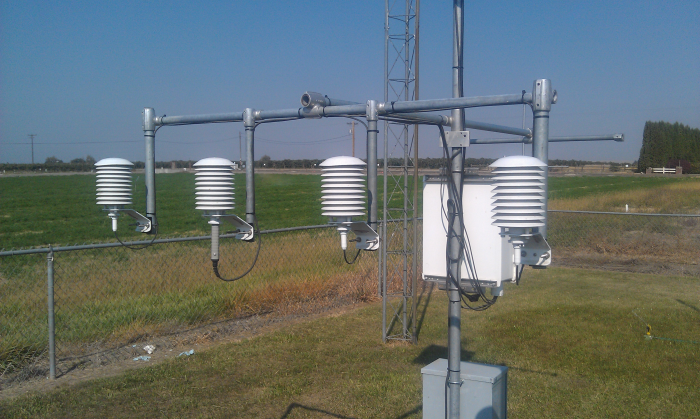 All of the stations have a standard set of variables, including air temperature, relative humidity, dew-point temperature, soil temperature (at 8 inches), rainfall, wind speed, wind direction, solar radiation, and leaf wetness, with some stations having additional sensors such as barometric pressure. Variables are logged at 15-minute intervals, based on a 5-second scan rate. All of the stations have CR1000s and are solar charged. Most of the stations have cellular modem telemetry. The data, along with the models and tools based on the data, are continuously updated on their website (weather.wsu.edu). The team behind this network is based at the WSU Irrigated Agriculture Research and Extension Center in Prosser, Washington, and has links to the research, extension, and instruction efforts conducted by all departments and research and extension centers of WSU’s College of Agriculture, Human, and Natural Resource Sciences. AgWeatherNet is supported most strongly by tree-fruit growers. AWN will also provide installation and maintenance services on landowner requests. AWN has a very well-developed maintenance program. Every piece of hardware is independently bar-coded and its entire history tracked. They always have spares so that they can quickly replace malfunctioning equipment. When a sensor comes in, it is either repaired or replaced and rotated into the inventory for later deployment. They perform their own calibrations and do extensive testing. For instance, they have an array of 107s they have co-located to look at precision among the sensors. They have been using the HMP45C for a long time, and when Campbell Scientific introduced the HC2S3 as a replacement, they promptly purchased several and have a test set up to compare data from three HC2S3 sensors to a co-located HMP45C. They have equipment to test and calibrate temperature, humidity, and wind speed and direction. One of the key distinguishing features of AgWeatherNet is that it not only provides data, but it also provides decision-support models and tools based on that data for specific interests. For instance, rainfall on ripe cherries can cause them to split, so growers have asked for text and email alarms when more than 0.1 in. of rain has occurred overnight. Additional models include cold hardiness for grapes and pollen tube growth for apples, among others.